James Dietz Handsigned and Numbered Limited Edition Print:"Into the Heart of Darkness"
About the Artist:The Sangin River Valley is commonly referred to by British Soldiers serving in Southern Afghanistan as The Heart of Darkness. In early 2007 Sangin, situated on the Helmand River, was the world's poppy capital and a vital Taliban stronghold. Given the Taliban's reliance on poppy to fund their fighters, control of Sangin was vital for the Taliban's survival and consequently would be fiercely defended. In April 2007, Task Force 1 Fury (1-508th PIR of the 82nd Airborne Division) while serving as the Theater Tactical Force (TTF) was called upon to clear the enemy from the town of Sangin in order to liberate two British forward operating bases that were under siege. Operation FURIOUS PURSUIT was planned to seize key terrain, remove the Taliban and provide lasting security to Sangin. In addition to Task Force 1 Fury, a Coalition Task Force was organized which included over 1200 British, Estonian, Dutch, and Canadian forces as well as Afghanistan National Army and US Special Operations Forces. 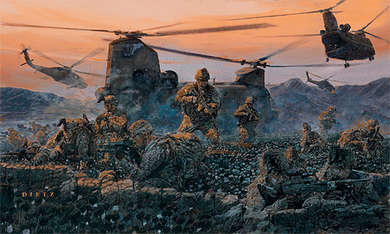 As the sun set over the mountains and dusk turned to darkness on 5 April 2007, despite a strong enemy defense network and with Task Force 1 Fury Scouts already decisively engaged in the vicinity of the helicopter landing zones, Task Force 1 Fury conducted an air assault beginning the liberation of Sangin. UH-60 Blackhawk and CH-47 Chinook helicopters from Task Force Pegasus (82nd Combat Aviation Brigade) flew their aircraft into the face of the enemy and withering fire, allowing Task Force 1 Fury the element of surprise and positioned them in key locations to find, fix and destroy enemy forces. As AH-64 Apaches provided aerial fire support, chalk after chalk landed until all required forces were in place. After three days of fighting and intense close quarters battle, the Sangin District Center was secure and Task Force 1 Fury was in pursuit of fleeing Taliban. This print commemorates the courage and audacity of the brave Troopers who risked their lives going Into the Heart of Darkness to liberate their besieged allies and bring peace to a troubled land.